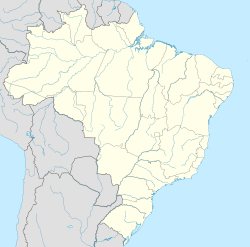 Igarassu (or IgaraçuA) is a city in the Brazilian state of Pernambuco. It is the second oldest city of the country and is situated on the north coast of the metropolitan region of Recife, approximately 32 kilometres (20 mi). It stands as one of the earliest European settlements in Brazil and is the site of the oldest church in the country, the Church of Saints Cosme and Damião, built in 1535. Igarassu is home to numerous colonial-period historic structures. The historic center of the city was designated a national monument by the National Institute of Historic and Artistic Heritage (IPHAN) in 1972. Igarassu was inhabited by Caetés Indians before the arrival of Europeans in the 16th century. Its genesis as a town came with the arrival in the area of Duarte Coelho Pereira in 1535. Coelho's arrival marked the beginning of the Portuguese settlement of Brazil. The town itself was established in 1537 as the village of Igarassu, which means “Great Canoe” in Tupi-Guaraní. It was one of the first European settlements of the Hereditary Captaincy (a Portuguese administrative division) of Pernambuco. Shortly after Coelho's arrival he ordered a rock landmark erected to mark the border between Pernambuco and Itamaracá; this still stands today. Igarassu was destroyed at the end of the Dutch occupation of Brazil in the mid-17th century. Architectural materials from the ruins of Igarassu were used to build the town of Olinda. Igarassu grew from the 16th century as a result of the sugar cane trade; the town served as a point of transport between the sugar mills on the interior of Pernambuco and the Atlantic Ocean ports. Igarassu was the site of the brief liberal republican Praieira revolt in 1848, in which the troops of Colonel Manuel Pereira de Morais were installed in the Convent of Saint Antônio. Today the Pinacoteca Museum stands in its place. One of the military officers who put down the revolt was Deodoro da Fonseca, later briefly the first president of the Brazilian republic. Suitable for water sports, has no deep water and is located 13 kilometres (8.1 mi) east of the city center. A sandbar islet in the middle of the Jaguaribe River delta, which can only be reached by boat or raft from Itamaracá or Gavoa beach. Its name means "Airplane crown". The islet has many luxurious summer houses. Also known as "Captain's beach", Mangue Seco is about 1,500m long, and at low tide the waves retreat some 500m. Its name means "dry mangal". The main economic activities in Igarassu are based in general industry, commerce and primary sector activities( sugar cane plantation and cattle). Tourism is also an important role due to its historical town center, beaches and the proximity with Itamaraca and Paulista beaches. The historic center of Cachoeira was designated a national monument by the National Institute of Historic and Artistic Heritage (IPHAN) in 1972. Five religious structures are also designated as national monuments of Brazil. A.^ The name of the municipality was written Igaraçu; it was changed to Igarassu in accordance with Brazilian reforms of the orthography of the Portuguese language. ^ a b Machado, Roseline Oliveira (2012). "Igarassu". Lisbon, Portugal: Heritage of Portuguese Influence/Património de Influência Portuguesa. Retrieved 2017-02-19. ^ "Igarassu" (in Portuguese). Brasília, Brazil: Instituto Brasileiro de Geografia e Estatística (Brazilian Institute of Geography and Statistics). 2017. Retrieved 2016-09-18. ^ "Igaraçu - Pernambuco". Recife Guide. Retrieved 2008-03-11. ^ a b Colwell, Dan (2000). Brazil. JPM Publications. ISBN 2-88452-117-8. ^ "Igarassu (PE)". IPHAN (in Portuguese). Retrieved 19 June 2016. Wikivoyage has a travel guide for Igarassu. This page was last edited on 28 March 2019, at 20:15 (UTC).